I’ve been dreaming of a good water filtered vaporizer for as long as I’ve owned my Volcano. It’s not that I’m worried about impurities from the vapor, but it’s the cooling and moisturizing effects I’m after. In the past, I’ve gone so far as to commission a glass artist to make a bong for my Volcano bag – but that doesn’t travel well. So I was really excited to see and get a chance to review the Hydrology 9 by Cloudious 9 vaporizer – a new entry to the crowded vaporizer market that appears to fulfill all my water filtered vaporizer fantasies in a compact and portable package. At a list price of over $200, this vaporizer is not going to win anyone over on price alone. But the good news is, it looks and feels expensive. The build quality is exceptional and it’s built like a tank. Do not drop this thing on your foot or glass coffee table! It has quite a bit of heft to it. Finely machined aluminum and borosilicate glass come together with the LED light show to create a Bellagio fountain of vapor in your hand. It really is impressive engineering. Bigger than a Red Bull can and heavier than one too, the Hydrology 9 is considered a ‘portable’ vaporizer, but I wouldn’t plan on throwing this in your pocket for a hike or a walk on the beach. Clocking in at just under 16 ounces this vape is better suited to a backpack than a pocket. And it’s anything but discreet. You’ll look like you’re hitting a little bong without a lighter. If this was to enter my regular rotation of vaporizers, it would not leave the house. For dry materials on the go, nothing beats the PAX2. If you like constant reloading, this is the portable vape for you. In my testing I was only able to get 0.175 grams of ground material into the chamber. For comparison the Easy Valve chamber on the Volcano holds at least 0.5 grams. I found the chamber needed frequent reloading and got toasty very quickly. In sharing this vape with another person, it seemed like each person would get about 5 good hits before a reload is called for. Of course that’s quite dependent on the individuals involved, but my take away is – for anything more than a solo session, you’re going to be reloading this thing more than you like. Like most portable vapes, you’ve gotta flip this upside down to access the chamber. Which is fine except it’s filled with water. The valve on the mouth piece does an admirable job of retaining the bulk of the water, but I found a little leakage with each loading. 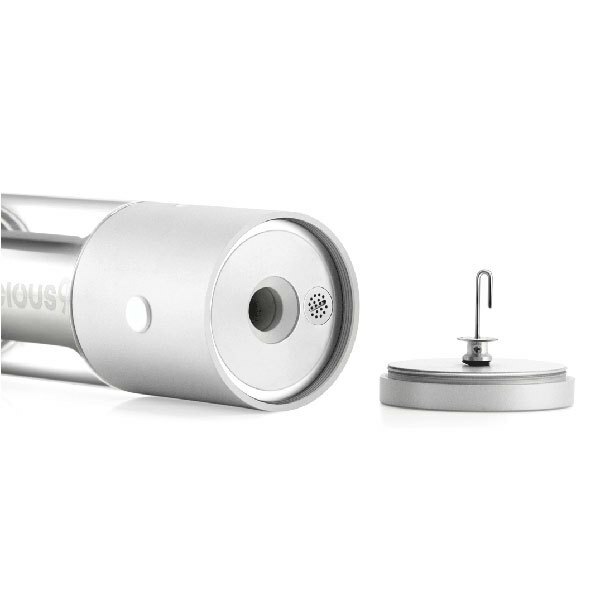 The chamber is sealed with a screw-on cap, which is the bottom of the vape. The screw threading is very fine and it takes a few turns to get it open – I think a magnet closure would have helped here. The chamber cap / base has an integrated stirring tool which allows you to stir the chamber without reopening. I was really excited about this feature but it fell a little flat for me. For one, the capacity is so small and vape session so short that by the time you think to stir, the chamber needs a reload anyway. Furthermore, when you pull the cap off to reload, and the stirrer pulls out – it brings a bunch of crumbs with it making a bit of a mess. Which might be fine if we had a magnet, instead of the fine screw threads, now getting clogged up with vaporizer poo crumbs. The Hydrology 9 produces good vapor and heats the material thoroughly and evenly. Honestly, I did not feel there was an adequate volume of water filtration to make much difference. Any increase in “smoothness” might have been offset by the rapid toasting of the material. You also seem to loose some of the terpenes to the water filtration. I found the same flower to be tastier out of the PAX2. Weekend warriors who like to impress their friends. Heavy users with tolerance will probably find the capacity too small and the reloading hassle to outweigh the benefits of filtration and fanciness. I've never wanted to love a vaporizer so much, but in the end it left me wanting. I’m on the edge between this and a volcano, eBay has digitials for $350. You’d recommend the volcano over this big time right? I only sesh at home really. If you can swing it – definitely go for a Volcano. BUT – whatever you do – do not buy a Volcano off eBay. If the price is too good to be true, it probably is. Lots of folks receiving counterfeit Volcanos from eBay sellers. There is very little margin for markup on Volcano products, so that’s why all the reputable retailers have them for about the same price. A new digital should be about $599 USD with shipping and usually some free gifts.